Cooking and preparing food is a great deal easier if you have a good knife. I spent years struggling with inherited blunt junk shop knives. 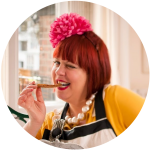 My mother doesn’t have a good knife, nor does my sister, my sister-in-law or my niece, and they are all keen cooks. Having a good knife doesn’t appear to be a female objective when it comes to kitchen tools. For male cooks it’s probably the first thing they would buy. ‘It’s changed my life’ she enthused. This summer, at my parents kitchen at their home in France, frustrated with the hand-me-down knives from previous occupants, I nipped out to the local supermarket and bought my mum a couple of knives: an all-purpose Chefs and a small ceramic paring knife. ‘It’s changed my life’ said my mum. 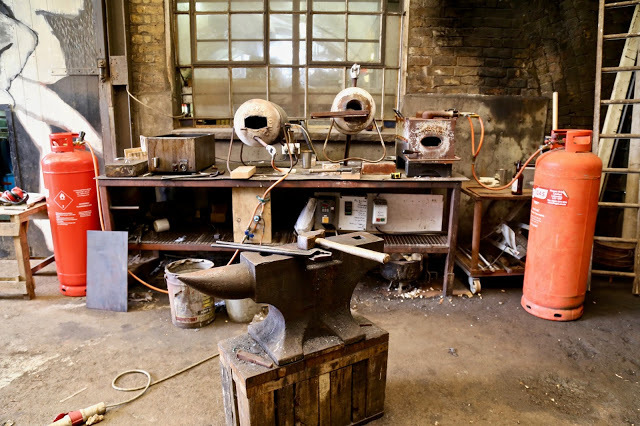 Earlier this year I visited Blenheim Forge in Peckham, which makes hand-forged knives. It was started by three self-taught friends in their late twenties: Richard Warner, Jon Warshawsky and James Ross-Harris. They met when they were students house sharing. Richard and James studied design engineering at Goldsmiths college while John did philosophy at Kings. Their workshop is under Victorian brick railway arches. Outside, the forge spits and hisses. Inside Richard shows me the raw material for making knives. I picked up a 2 foot steel square rod, quite heavy. Are the Japanese the best at steel? 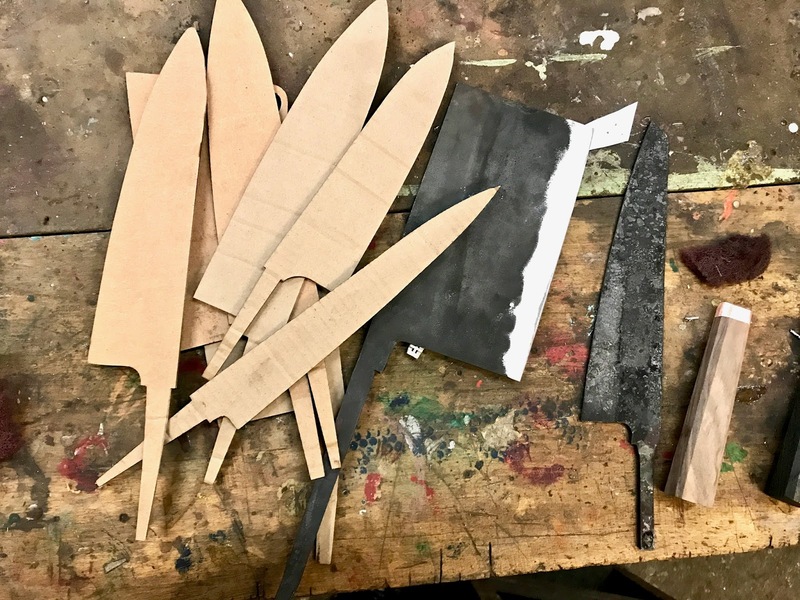 How did you learn to make a knife? I looked at one of their beautiful knives. It’s almost like the rings of a tree. It’s the millefeuille of knives. Have you sold to any famous chefs? Price-wise how do they compare? 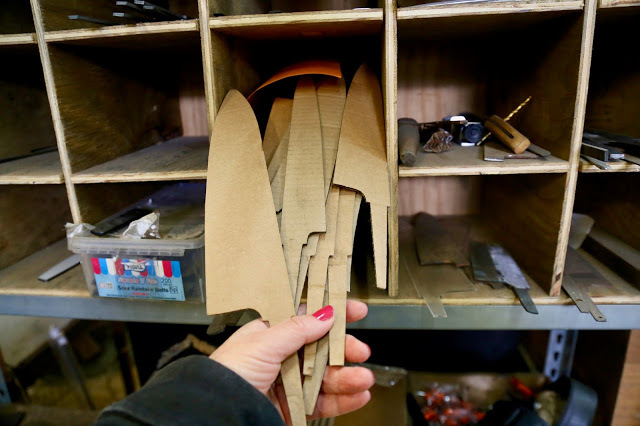 On another scarred wooden bench, I pick up some cardboard templates. How long have you been making knives now? That’s not very long, and you’ve got to this point within 3 years. Jon shows me how he cuts out the shape of the knives. He places the cardboard template on the hammered and laminated steel. 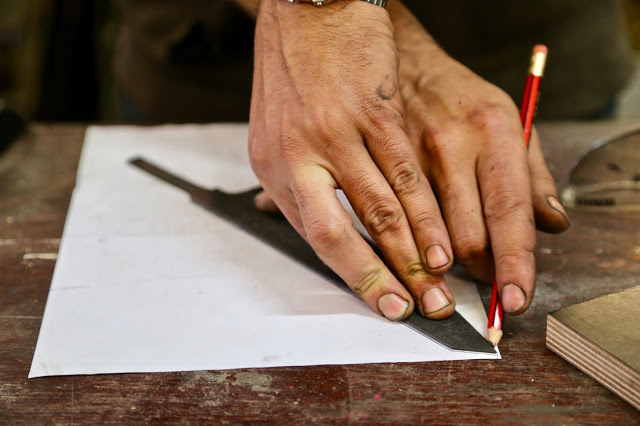 When you are making a knife, do you want it light or heavy? I’ve got a Santoku, which has a kind of diagonal at the end. In China they are using cleavers with great expertise, a huge thing that can do quite delicate things sometimes. Do you make cleavers as well? I see a box of thick wooden sticks. Is the wood you make the handles from? 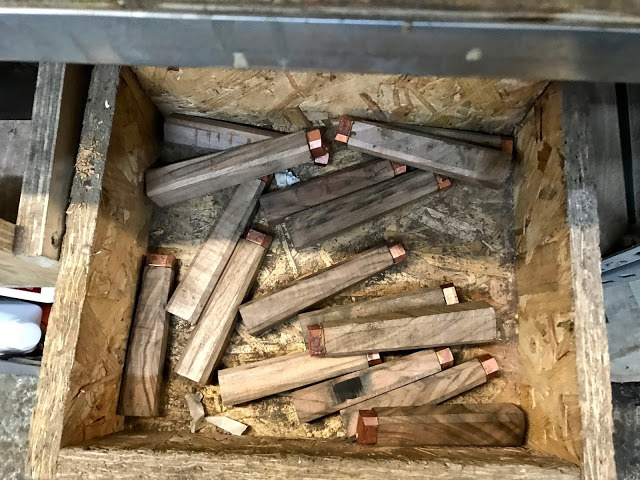 Why do you use copper? Where do you see yourself going with this? More types of knives? Is that enough to make a living off, for the three of you? Are you trying to make them as uniform as possible? Or is each one individual? ‘You want them all to be different in some respects’. Do you feel like some of your soul is going through to the chef? Can you melt the steel down and use it again? Do you have slightly bodged-up ones that you sell a bit cheaper? Do people ever come back and complain? 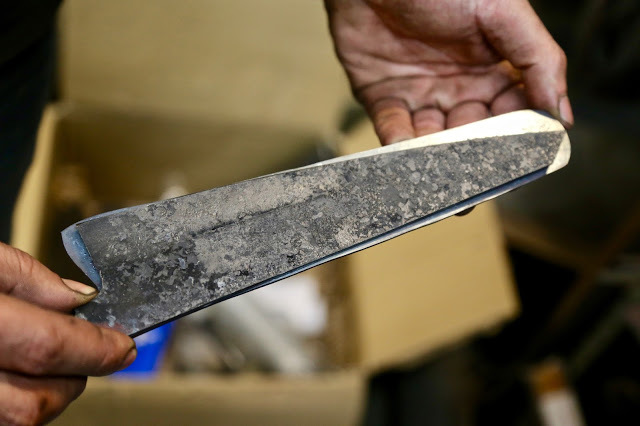 ‘If a knife was rejected, we’ve profiled it wrong. The finish is not good…’ Jon strokes a knife: ‘The handle and blade fit well on this one. It’ll be a bit of a step with your finger. You’ll have a little sharp corner in there. That seems like a detail but after using it for hours, you’ll notice. Have you got good knife skills? There are about 20 knives in front of me. Are these ready to go out to customers? 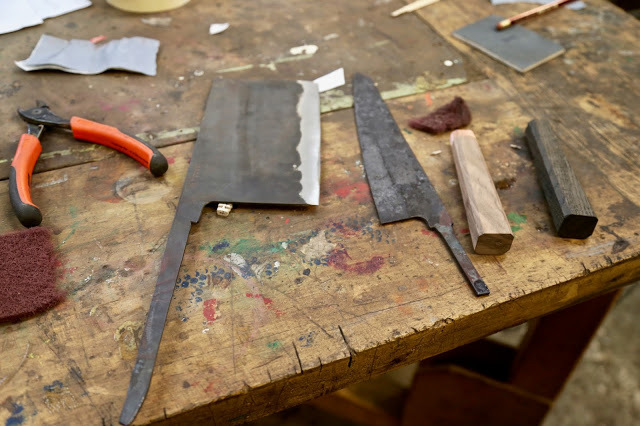 Do you make ladies’ knives or men’s knives? Obviously women have smaller hands. This is why I like the Santoku. The Japanese are also famous for making swords. I’ve heard there are 500 words for cutting in Japanese. 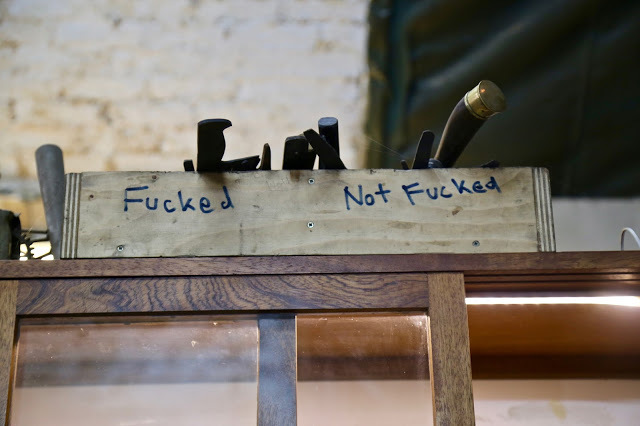 I wondered if John liked making knives because it’s more clear cut than philosophy. Do you make axes? I had a boyfriend who was a lumberjack. He was a genius with an axe. 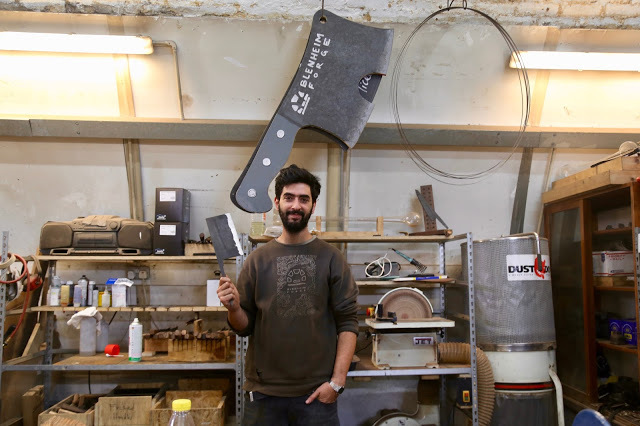 The way he behaved with an axe- it was like an extension of his arm. On another bench there’s a French guy, using the workshop at the weekend, making a large knife for his dad. On top of a cupboard I see two cardboard boxes, with the labels ‘Fucked’ and ‘Not Fucked’. ‘…when they first started. Obviously they worked a lot to develop their skills and on the way… ‘ he shrugs. So out here, what’s happening? 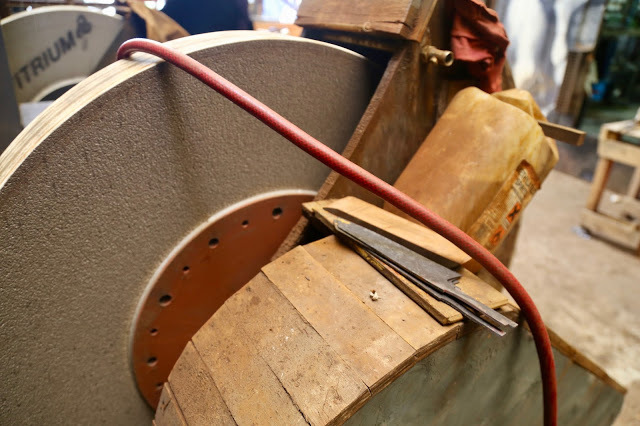 Is it very expensive a giant grinding wheel like this? ‘You can’t buy it. we made it. That’s why it looks so pikey’, Jon grins. We hear the rain hammering down outside and the train overhead. It’s a wonderful Peckham day. Is there a reason you started in Peckham? Come to Kilburn, it’s not cool. Prices from £140 to £280.